Kiba and Kumba Tri Towers Solitaire. Join the two monkeys on a fun solitaire adventure and discover their castle hidden in the jungle! Objective of the game is to clear all three peaks made of cards. Only cards that are lower or higher than the card at the bottom deck can be removed. Use a wild card if you are stuck and try to win as many rounds as possible. Can you earn a high score? This game can be played on all devices. This game is one of the mobile board games on Round Games. 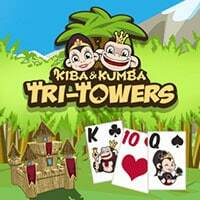 Kiba and Kumba Tri Towers Solitaire is a free online game on RoundGames.